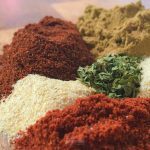 Homemade taco seasoning is the key to tacos and taco-flavored goodies whenever you want! How awesome is that? Learn to make it home with this simple recipe! Mix together and use. Stores dry in an airtight container.